Looking for recommendations on the best weighted blankets for children? Then chances are you’re already familiar with their many potential benefits. In fact, a number of studies suggest weighted blankets may help kids with insomnia, autism, ADHD and anxiety get better sleep. And a growing number of parents agree. Heavier than regular blankets, weighted blankets usually contain plastic poly pellets or tiny glass beads, which apply gentle, evenly distributed, pressure on the body. 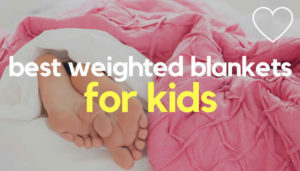 Weighted blankets for children come in different weight sizes (for example, 5, 7 or 10 lbs), so they can suitably accommodate the size of an individual child. The extra weighted in a weighted blanket applies gentle pressure or deep touch stimulation (DTS) to a child’s body. Some people say this gentle stimulation feels a bit like a ‘gentle hug’ or massage. The DTS or ‘gentle hug’ encourages the brain to release neurotransmitters such as serotonin and dopamine, which can help to induce a soothing effect on the body, by helping to calm the nervous system. This in turn can promote more restful sleep in children who have trouble calming down or dropping off to sleep at night. Who Are Weighted Blankets For? 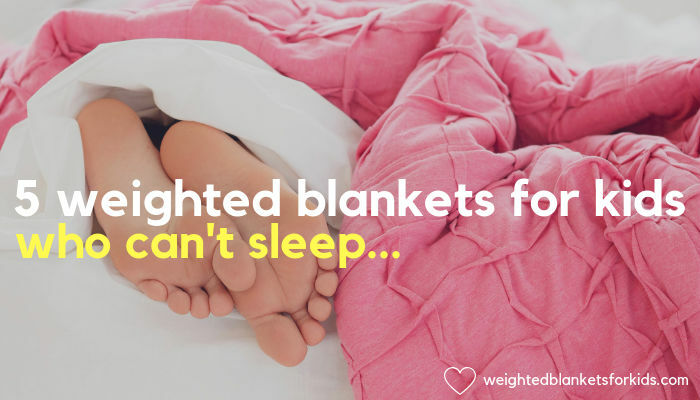 Teenagers and adults can use weighted blankets too – the size weight of the blanket simply increases in line with their weight (10% of their ideal body weight is generally recommended). How Heavy Should A Child’s Blanket Be? 10% of a child’s body weight, plus 1 or 2 pounds. This helps ensure the blanket provides sufficient stimulation for a child’s size, without becoming too heavy. When choosing a weighted blanket for your child, opt for a material that will suit them best. If your child gets hot easily, a 100% cotton blanket will be the more breathable option, as it retains less heat. Fleece or minky blankets, on the other hand, tend to be warmer & more tactile and may suit sensory kids better. If you’re child is extremely sensitive, plastic poly pellets may occasionally prove too stimulating. 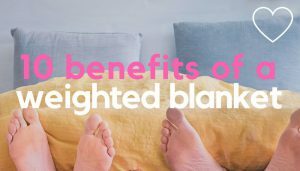 If so, try a weighted blanket filled with tiny glass beads – they tend to sit softer on the body and rustle less. Verdict: The Harkla weighted blanket for children is a popular blanket with consistently positive reviews. Made from Minky Dot Fleece, the blanket features tactile dots, making it a good choice for sensory input. As it’s made from Minky, the blanket is quite warm, so perhaps consider a cotton weighted blanket if your child gets hot easily. Whilst it’s not the cheapest blanket out there, there’s a Lifetime Money Back Guarantee and a range of colours to choose from (grey, blue & green and lavender & purple). Note: There were a few reports of plastic filling falling to edges/giving off an odour. Harkla have rectified these issues with an updated design, which uses glass beads & more evenly distributes the filling. Where any faint smell remains in blankets that do contain poly pellets, Harkla recommend airing the blanket for a day or two. Verdict: Quility weighted blankets for kids are a best seller on Amazon, with consistently positive reviews. Quility also offer one of the more extensive range of blankets. All blankets are made from cotton, but you can choose from a plastic poly pellet fill, with an 80% cotton/20% polyester cover or a glass bead fill and a Minky Dot polyester cover. Note that the glass beads are also placed into polyester padding to prevent them from moving around. The poly pellet/cotton cover mix is likely a cooler option over the Minky Dot/bead fill blankets. Make sure you check individual product details to ensure you have the specification you want! Verdict: All YnM weighted blankets have a 7 layer design, which the manufacturer claims distributes the weight more evenly and aids better temperature control. This suggests the blanket could make a good choice for children who are prone to getting hot. 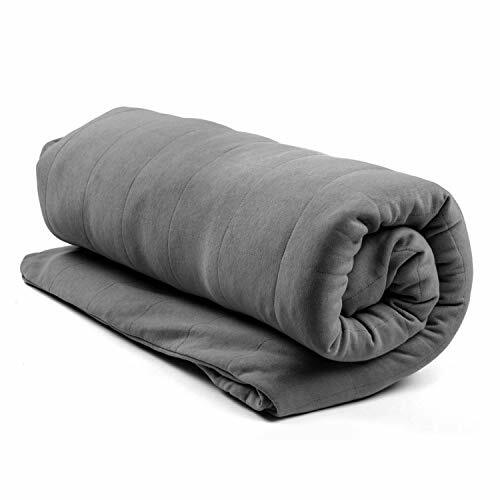 Keep in mind though, only the weighted blanket insert is included – if you want a washable cover (not essential, but a good idea if you want to keep blanket clean), you’ll have to buy this separately. Sensory Minky Dot covers are available, as well as cotton options and child friendly designs. Make sure you match the blanket insert size with the correct size cover. There have been a few reports of bead leakage, but you’re covered with a 3 Year Warranty for any faults. Verdict: Mosaic Weighted Blankets was set up by Laura LeMond, who experiences sensory issues herself, something reflected in the personal ‘feel’ of the company. Not only are all the blankets hand made by a team of seamstresses in Austin, Texas, Mosaic Weighted Blankets also offer one of the most extensive ranges of weighted blankets for kids around. 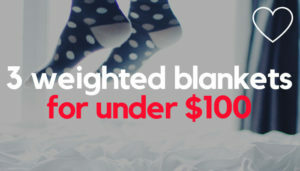 Blankets start at 5lbs and are then available in 1lb increments, which means you’re not restricted to the more standard 5, 7 and 10lb child weight brackets. Blankets are available in cotton or Minky and come in a range of colours and designs (suitable for boys, girls & teens). You can even commission a custom made blanket to your own specifications. 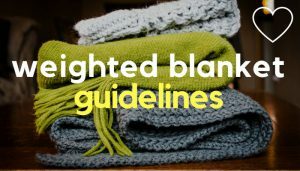 Keep in mind, covers are not removable, but blankets are washable up to a recommended weight of 12lb (commercial washers are recommended for blankets over 12lbs). The blankets above are not always available in the UK and Europe (YnM blankets are) – however, don’t worry, because Senso Rex offer some excellent weighted blankets for children in the UK/Europe. If you’d prefer more choice, Etsy is also a good place to look for homemade weighted blankets suitable for children. Verdict: Senso Rex produce a wide range of designs specifically aimed at children and come in sizes from 1kg (2.2lbs) up to 6kg (13.2lbs). The blankets are made from 100% breathable cotton. Although there’s no sensory Minky fabric available, the cotton fabric designs do come in a range of fun styles and sensory patterns. These include unicorns, dinosaurs, football, cats, space and geometrical owls. There’s even a Frozen or Star Wars inspired blanket for mini movie buffs! 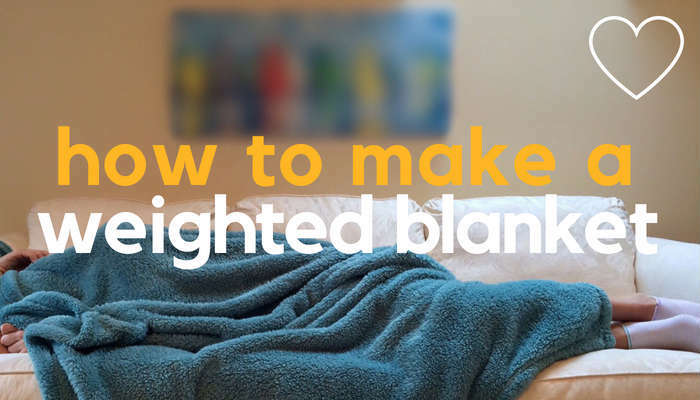 Whilst the blankets do not have removable covers, the blankets are washable. Do you have a child with a sensory processing disorder who craves sensory input? 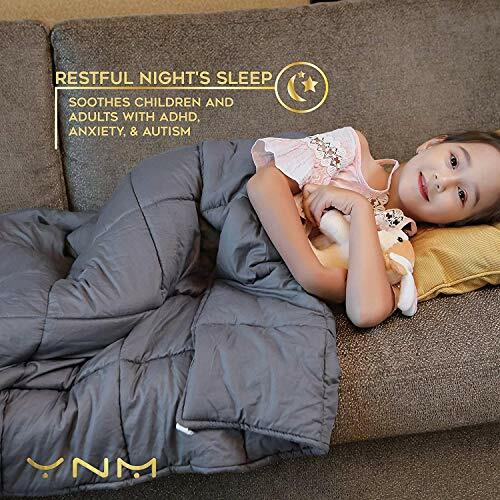 The deep touch stimulation and raised tactile dots on a minky dot weighted blanket may help sensory seeking children self sooth, so they can calm down and get better sleep. Many parents with sensory seeking kids swear by them. Check out 3 weighted blankets for sensory children here. 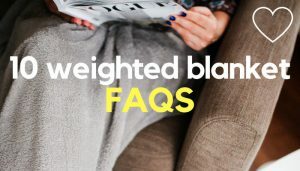 Are There Any Guidelines On Using A Weighted Blanket? Weighted blankets are generally recommended for children 5 years & up. You should never use a weighted blanket with a baby, or child who cannot move the blanket freely on their own – it could pose a suffocation or over-heating risk. Weighted blankets should also never be used to restrict movement or pulled up beyond the shoulders. They should also not be used when pregnant. You can find some more commonly accepted guidelines here. If unsure, or your child has a specific health problem, always consult a healthcare professional for advice. As parents, we all want our children to get a good night’s sleep. Sleep has a host of essential benefits – from aiding growth and better learning to improved mood and health in general. 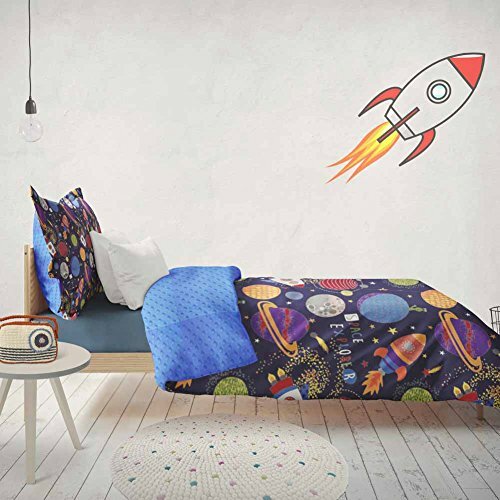 But with more children suffering from sleeping disorders and symptoms associated with autism, ADHD, ADD and anxiety, parents are increasingly looking for ways to help their kids naturally get a better night’s sleep. 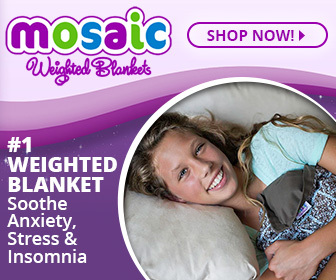 A weighted blanket for your child or teen could be just what you’re looking for.